Essential (ethereal) oils are specific liquid products of plant tissue. They include aromatic compounds of volatile, liphophilic constituents (fat-soluble) that synthesize and metabolize in the secretory structures of plants. Typically, essential oils are extracted from higher plant species such as: Asteraceae, Laminaceae, Rutaceae, Myrtaceae and Lauraceae. Essential oils are mainly extracted from the root, tree, leaves, flower and fruit of the plant. Different types of essential oils are produced from one plant depending on the plant part they are extracted from. Essential oil is very difficult to standardize to always ensure the same colour, flavour and aroma because these are variable features of oil that depend on the climate control factors (temperature, humidity, time of gathering of raw material , etc. ), method of processing and oil hemotype (a species includes several types of plants). If oil does not always have the same appearance it proves that it is a real natural product without artificial aromas, colours or preservatives. Most of the food we buy in stores has standard flavour, aroma, appearance and colour due to large quantities of chemical additives that enable product standardization. We forget that nature is infinitely diverse and the only real source of life energy for our organism! It is estimated that synthetic oils make 95% of the current world market of essential oils, while 5% is the market share of real natural essential oils produced only by steam distillation of plant material. It is very difficult to assess if an oil is natural or artificial on the basis of its aroma; therefore, the quality should be guaranteed by the oil producer and supplier. Plant name, Latin plant name, constituents, LOT number, shelf life, growing type and country of origin are the elements indicated for quality natural oil. Real therapeutic grade oils must have good chemical composition, which is proved by special analysis – gas chromatography. Therapeutic effects of the essential oils have been known in Egypt, Rome, Greece and India for ages. Nowadays, these oils are mostly used in medicine and pharmacology, cosmetics, perfume and food processing industries and agriculture. Essential oils are obtained by steam distillation. Large quantities of the plant material are needed to produce a small quantity of the plant essence – ethereal oil. A litre of the oregano oil is extracted from about 100kg of dried oregano leaves! That is why the essential oils are highly concentrated substances that have to be diluted before use. The oil used for dilution of the essential oil is called carrier oil or base oil (olive oil, grape seed oil, sunflower oil, etc.). For safe use of the oil, always first read the instructions for use and consult the appropriate expert. These oils are mainly used for inhalation, massage, aroma lamps, diffusers, bath, face skincare treatment and internal use. Before using an essential oil perform a test (particularly sensitive persons) by applying the oil on the inner forearm. Apply a small quantity (a drop) of oil diluted in carrier oil and in case of absence of any allergic reactions (redness, rash, itch) during 24 hours, the oil can be safely used. 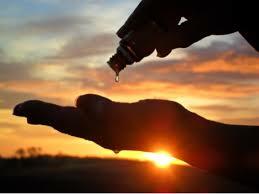 For internal use, a small doze of oil can be used in the morning – a drop diluted in a tea spoon of edible oil. In absence of any allergic reaction during 24 hours, oil can be consumed by drinking, and number of drops is to be gradually increased in accordance with the instructions for use. Drink the oil in the morning so that you can easily seek medical help in the course of the day if some allergy reactions occur. If you are allergic to a plant than you will positively be allergic to the essential oil extracted from that plant. Essential oils are not for use during pregnancy, breast-feeding, in children younger than three (some oils are not for use before the age of 7-12), by epilepsy, schizophrenia, serious liver and kidney disease patients, or by patients having a swallowing act problem (in case of internal use). Oils containing menthol, camphor, 1,8 cineole must not get in contact with skin of babies and small children because they can cause Kratschmer reflex – apnea (cessation of respiration) and total collapse!!! Never take more than three different ethereal oils for internal use at the same time and always wait at least an hour before taking a new oil doze in the course of a day. After regular internal taking of oil for one month always wait 15 days to a month before starting new taking of the oil. Ethereal oils are kept in small, dark glass bottles at low temperatures, away from sunlight. These oils cannot be spoiled but can oxidize and become pitch, especially if they are not properly stored. Essential oils require careful use, almost with awe, because these mighty substances can help us recover our balance and health, but if we abuse them they can be harmful more than healthful. Always have in mind that “Natural means – not much “.